« Avoid profane and vain babblings. Life is short. Treat each day as your last, and you will never sin. Today is the Twenty Seventh Sunday after Pentecost and also the apodosis of the Entry of the All Holy Theotokos into the temple. The Apodosis is the last day in which we sing hymns for the feast. All feasts in the Orthodox Church have three parts to them. The first part is preparation. We sometimes prepare by fasting as we are doing for the Nativity. And we always have preparatory hymns beforehand, especially in the Katavasia of the canon, which are hymns that are said at the end of each ode of the canon in the All Night Vigil for Matins. There are other hymns we also sing. Sometimes we even have entire services that are just before the great feast itself, like for instance we’ll have vespral divine liturgy for the pre-festival of Holy Nativity of the Lord the day before the Nativity. So we prepare for the outpouring of grace that God will give us on a particular feast day. Without this preparation and expectation, we will surely not be able to accept and understand much of what God wants to impart to us on the day of the feast, and those days immediately following. Then of course there is the feast day itself when we sing hymns and commemorate that specific occurrence, that specific saint especially. After this there is the post-festal period, the time in which we still sing hymns about the feast and we remember it and we, like the Theotokos, “treasure these things in our hearts” , as is said of her by the Evangelist concerning all the things that she saw in her life that Christ did and said. She treasured them all up in her heart. We should be like that, too. We should not be so quick to let go. When God gives us grace don’t let go so fast. Don’t immediately forget and go out into the world and just forget what happened the past week, the past Sunday, yesterday. We must take time to think about these things and muse over them and pray about them. And then on the last day, if it’s an especially great feast of the Lord or of the Theotokos, we almost reprise the feast. We sing the same hymns – not all of them, but many of them that we sang on the feast day itself. So for instance today we had the troparion and kontakion for the Theotokos’ Entry. We also sang the exact same Epistle and the exact same Gospel that was said on Wednesday morning when we had the Divine Liturgy. We also commemorate the Hieromartyr Clement, Pope of Rome today. 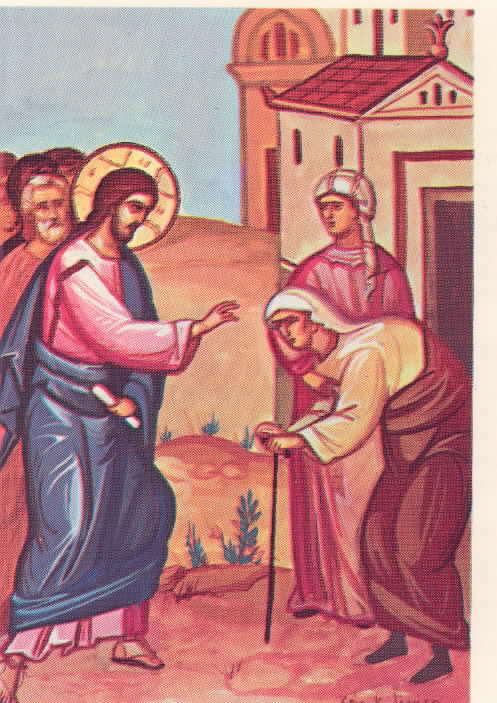 And in the primary reading for today we hear about the healing of the woman who had an infirmity of eighteen years, and she was healed on the Sabbath day. As is usual, in the readings of the Gospel, there is an inner and an outer meaning. The outer meaning is pretty clear to see, when Jesus Christ rebukes this synagogue leader. It is very clear how foolish his words were. So we know the outer meaning that there is no time prescribed especially for mercy. All time is for mercy. God implants in us an understanding of things, and we have to be able to judge rightly. And we know when we should show mercy. There is no time when man should put some law ahead of showing mercy. There is an inner meaning, too, because this woman was all bent together. She could not straighten up. She could in no wise lift herself up. There is a great meaning to that infirmity that she had, and our Lord’s healing her on the Sabbath day. Our Lord was teaching in one of the synagogues on the Sabbath, and this was a habit of His. This is a very Jewish habit to speak all day in the synagogue on the Sabbath. And we try to emulate that in a poor way, unfortunately like the apostles did it, because of our sins and laziness. Not like the early Christians did it, who had so much zeal. But we serve the All Night Vigil and we serve the Divine Liturgy and we preach at the Liturgy and I often preach at the Vigil as well because we need to know as many holy things as we can. We need to continually be feeding ourselves with holiness, because we’re so continually, unfortunately, imbibing the bitter dregs of the world. So we must do something to dilute that and to eventually cast it out. And if you do not meditate upon holy things, you won’t become holy. It’s too bad that we don’t spend all day speaking of holy things. It would be good if we did. The purpose of our gathering together on Saturday and Sunday is to worship, to expect God to do something to us by partaking of His mysteries to be sure, to have enlightenment, the medicine of immortality within us. But also, to taste something of the sweetness of the Church’s theology. It’s God-breathed, you know. The services are inspired by the Holy Spirit and they breathe as the Holy Spirit breathes. And if you listen and if you pray, you can hear it. You can hear God in His services. Saturday and Sunday are consecrated to our remembrance of God. Unfortunately we do not Him remember every day. Unfortunately, we fall into grievous sin. We get distracted. But if we can struggle to pay attention on Saturday and Sunday, whatever our position (I struggle to pay attention, too) – God will enlighten us. Of course, we will break bread together, most of us, and be able to taste of the heavenly bread. But I tell you, if you don’t come here with an expectation that God will teach you and enlighten you and make you straighten up, as one who cannot lift yourself up, and if you do not struggle, then you will come away today poor and wretched and unenlightened. You might commune but you won’t have received any benefit from this heavenly food because you won’t have struggled. So you must struggle. Struggle by coming to the vigil and having expectation that God will teach you, listening as well as you can. And when you fall away from listening, pull yourself back. I don’t know any other way to do it. I don’t know any other way to explain it. You just struggle and struggle and struggle. And eventually God will indeed make us capable of those things that we are struggling to do. He will help us. The God-man can just say, “Thou art loosed.”, and she was loosed from her infirmity of eighteen years, long standing pain and sadness over her infirmity. It was a long time, and the fathers say that this was mentioned so that we could know, this was God’s work. This is in God’s territory. God can heal a man. No man can heal another man. And this is a very simple miracle. There is not much fanfare to it. There is not much of a lead up to it, such as in the miracle of Jairus’ daughter , where there is a whole procession that occurs. And that has something to each us. Why was this woman oppressed? I told you before, again, I say it was her sins that oppressed her. This is a great mystery. We don’t always know why a person suffers. Sometimes they suffer because of their sins, sometimes not. But that is God’s territory. We cannot delve into these matters. We must only speak of them with fear and trembling, so as not to offend the Divine Majesty. Some people grow old and fat and they are wicked. Some people are young and they die in virtue. Some people struggle and never seem to be able to get around the problems of life. Other people have a relatively easy time of it. God knows for each man what his position in life should be for the best possibility for his salvation, and we don’t know. But this woman was bent and crooked, so the crookedness indicates that she was suffering because of her sins. And she suffered manfully. She suffered for eighteen years. And she came to the temple, and she was hoping to be cured. What an odd thing that must have been to hear. Here a person comes laid out, unable to move their limbs, and Jesus Christ says, “Thy sins be forgiven thee.” Some of these people must have thought, “Well, yes, but don’t you see what’s wrong with the man?” And then others thought, “He blasphemes.” But this man was sick because of his sins, and this woman was crippled because of her sins. And God enlightened both of them. He healed them of their sins first. He loosed this woman of her infirmity so that she could look up at the God-man, and then she could commence to live a Christian life. Only God can make that which is crooked straight. And so what happened when this woman was loosed from her infirmity? You would think that everyone would have been in awe before God and they would have fallen on their faces saying, “Lord have mercy.” But what happened? What amazing words. What amazing stupidity. This man was filled with envy and jealousy, and that’s what clouded his mind. His anger made him crazy to say such insane things. What kind of beast would liken mercy on the Sabbath day to common labor in the field? Isn’t the Sabbath a day of rest, though? He’s right about that. The ruler of the synagogue is saying a partial truth you know. The Sabbath day is a day of rest according to the Jewish law. And our Sabbath, our day of rest, today, is the same, where we should rest in Christ and meditate on holy things. But is not Christ giving this woman rest? Is He not fulfilling the Sabbath day? Indeed. This woman had eighteen years of no rest, of sleeplessness, and of hunger, and of pain, and of despondency. And our Lord, on the Sabbath, the day of rest, gave this woman rest. And this synagogue leader was too stupid, too full of pride, too full of arrogance to see this. Notice how he addresses this question that he brings up. He does not say anything to Christ directly. He doesn’t have the guts to do it. But he is aiming for the glory of men, for the honor of men. So what does he do? He says this out to the congregation, so as to get partners in crime with him, so as to feel emboldened by other people being full of sin. But the Lord answered him very simply and plainly. And he said a word that does not occur very often in the scriptures, by the way. And when it occurs, you should be terrified, concerning what a hypocrite is. To be called a hypocrite is indeed a terrible thing. And hypocrisy is something that is probably present in each one of us. It is a sin. We must confess it. We must root it out. Our whole society is full of hypocrisy. Our whole society runs on hypocrisy. It is a lie. It is trying to look like something we are not. It is not being genuine. It’s making false promises. It’s not showing mercy when we proclaim ourselves to be Christians. It’s not praying for our brother when we see he has a need because we have some other task that troubles us. It’s not living the Christian life when we have made that promise in our baptism. Now this woman was called a daughter of Abraham. And why? On account of her faith. “I am the God of Abraham, and the God of Isaac, and the God of Jacob? God is not the God of the dead, but of the living.”  This woman was not dead. This woman was alive in faith. She had faith, and therefore she was considered a daughter of Abraham. And Jesus said in another place to a man, who had also been healed of his infirmity, having nothing wrong with him physically but being filled with the sin of lust for wealth, that is Zacchaeus: “ This day is salvation come to this house, forsomuch as he also is a son of Abraham. For the Son of man is come to seek and to save that which was lost.”  So indeed he is a son of Abraham, and this woman is a son of Abraham, and not because of her virtue but because of her belief, and because of her desire to live virtuously. But He wouldn’t say such a thing about the ruler of the synagogue now, would he? He called him a hypocrite. Here is what Jesus has to say about the hypocrites. In another context, it was written that, “They answered and said unto him, Abraham is our father. Jesus saith unto them, If ye were Abraham’s children, ye would do the works of Abraham.”  So this is why I tell you that this woman was a daughter of Abraham on account of her faith. You can see that to be called a son of Abraham or a daughter of Abraham means that you believe and act according to your belief. And even though this woman had some sins that had bound her, God released her. And now she was able to live virtuously. There is a practicality that I think we should inculcate in ourselves, that we can learn from this particular passage of scripture. It’s easy to see that one should show mercy on any day. And yet this man, this synagogue leader, this sinner, didn’t see that, because he was so concerned about other extraneous details, and concerned about the boastful pride of life, and the honor of men. But if we’re guided by the Holy Spirit, we can discern rightly. We can discern truly. We can see what is right and what is false. We can understand. We can know that the body is not for meat. Meats are for the body , and if one has a need according to the body, one eats according to one’s need. We understand that principle in fasting. It is because the Holy Spirit inspires us, and makes us know. Makes us understand that only if we have humility, only if we expect and hope that God will fill us with His grace. And then of course we have to act upon His grace, and we have to root out this sin of hypocrisy that is being shown. A hypocrite will not inherit the kingdom of heaven. And I also tell you that the vast majority of people in this life are hypocrites. It is true. It is very true. That is why there is so little piety in our day – because people give lip service. These people, their heart is far from me. Their lips speak about me but their heart is far from me, the Lord says. And that is what our day is like. Root out from yourselves hypocrisy, brothers and sisters. If there is anything in you that puts on airs, if there is anything in you that forgets to show mercy, if there is anything in you that looks for the honor of men, if there is anything in you that is lazy and does not wish to worship God at the appointed times, then you have something to repent from: your hypocrisy. Because you made promises, as I made as well. It’s true, I suppose on a small level, moment by moment we fall into moments of hypocrisy. Let us not be hypocrites. Let us ask God to enlighten us. And in any sin that we have, whether it be hypocrisy or any other sin, let us fall down before Christ. Let us ask Him to forgive us. And then we have to seal our part of the bargain. We have to make an effort to live according to His commandments. May God help us in all things. Amen. “Commentary on the Gospel of St. Luke”, St. Cyril, Patriarch of Alexandria. This homily was transcribed from one given On November 25, 1996 according to the church calendar, being the Twenty Seventh Sunday after Pentecost, and Apodosis of the Entry of the All Holy Theotokos into the Temple. · Hymns are sung sometimes weeks in advance of the feast, especially the Katavasia at the canon. · In the case of especially solemn and important feasts, fasting in enjoined (such as before the Lord’s Nativity, Pascha, the Dormition of the Theotokos, and the Feast of Saints Peter and Paul). · There are often pre-festal services in the immediate day or days before the feast. An example of this would be the true Vespral liturgy (this is NEVER substituted for Vigil and liturgy on the day of the feast itself) that the Typicon directs to be served the day before Theophany and Nativity. The entire week before Pascha, “Holy Week” is considered a “pre-festal” period! If you miss even one of those services without due cause, you are cheating yourself out of a full understanding of the feast, and a full measure of the outpouring of God’s grace upon you. · The Feast itself is always served with Vigil with Divine Liturgy the following day. If vigil is not served, great vespers with a FULL matins (otherwise the essence of the feast is lost) and Divine liturgy is served the next day. · In the days following the feast, sometimes up to a week, or in the case of Pascha, even until The Ascension, forty days later, the feast is continually remembered with hymns. · On the last day of the feast, it is recalled again with many of the hymns that were sung on the feast day itself. The Orthodox way of celebrating a feast, unfortunately forgotten or ignored in our day, is very “Jewish”. For example, Pentecost was a three day feast for the Jews. This day was also the commemoration of Hieromartyr Clement, Pope of Rome The Epistle reading appointed is Ephesians 6:10-17, and the Gospel is 13:10-17. There are some stylistic changes and minor corrections made and several footnotes have been added, but otherwise, it is essentially in a colloquial, “spoken” style. It is hoped that something in these words will help and edify the reader, but a sermon read from a page cannot enlighten a soul as much as attendance and reverent worship at the Vigil service, which prepares the soul for the Holy Liturgy, and the hearing of the scriptures and the preaching of them in the context of the Holy Divine Liturgy. In such circumstances the soul is enlightened much more than when words are read on a page. Cf. Luke 2:18-19 “And all they that heard it wondered at those things which were told them by the shepherds. Cf. Mark 5:22-42 and Luke 8:41-56, where the raising of Jairus’ daughter, and the healing of the woman with an issue of blood is recounted in powerful detail. Cf. Matthew 15:8, “This people draweth nigh unto me with their mouth, and honoureth me with their lips; but their heart is far from me.” and Mark 7:6, “Well hath Esaias prophesied of you hypocrites, as it is written, This people honoureth me with their lips, but their heart is far from me.” See also Isaiah 29:13, which the Lord quotes. Cf. Luke 13:25, “When once the master of the house is risen up, and hath shut to the door, and ye begin to stand without, and to knock at the door, saying, Lord, Lord, open unto us; and he shall answer and say unto you, I know you not whence ye are”. This entry was posted on Saturday, December 12th, 2009 at 9:19 am and is filed under Homilies. You can follow any responses to this entry through the RSS 2.0 feed. You can leave a response, or trackback from your own site. I have not thought about this story since I was a little child and listened to it for the first (and as far as I can recall, only) time in my Baptist Sunday School class. Since then I’ve read through the gospels more than once, but for some reason, since hearing the story as a child, it passed by unnoticed by me. Now it comes back to my remembrance, decades later, as another metaphor for my life. Thanks be to God for his indescribably mercy! He saw my suffering, he called me to Him and loosed me from my infirmity. The healing process is slow from my earthly perspective. In many ways I am still bent. But He now stands before me and even bent over I can see His precious pierced feet. Slowly but surely, He is lifting my head to see more and more of Him. One day I will be made entirely straight and will see His blessed face–but even now, with my still crooked body, I am glorifying God for His healing and His unfathomable love and mercy towards me. Thank you, Father, for this wonderful lesson, and Deborah – wonderful commentary. I never happened to think it all over under this angle. I never saw myself in this bent woman…And now, as i often happens, I am surprise how could I not notice, it’s so simple, so vivid! But better late than never. I am glad that I see now this metaphor, and it corresponds so much to me. We are bent to earth, we investigate earthy things, we are so attentive to what consists our earth life that we don’t notice how low we bend. and at a certain moment we already cannot unbend….without God’s help. This is what a secular world & our allegiance to it makes with us. We, born to be straight, free, aimed at Heaven, become moral cripples, and God’s image in us is distorted to a great extent…But everything is possible with God. Thus I have the hope to unbend! Now it is my turn to say thank you, once again (I don’t think it is possible to say it too often)–to Father for his inspiring teaching, to Natalia for these words and to the Lord for sending us teachers, guides and helpers of our souls. You must really like this story, since it made the cut for your list of 8!